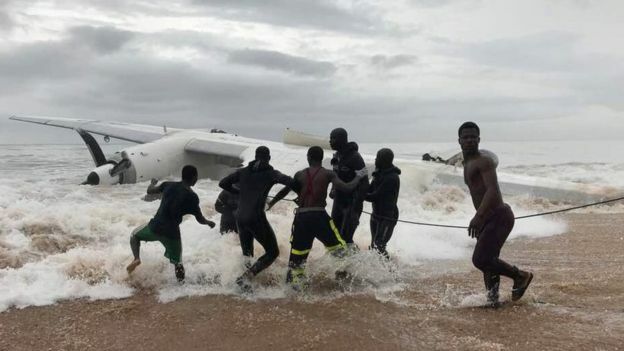 A cargo plane has crashed into the sea off Ivory Coast, close to Abidjan airport, killing four people and injuring six. The wreckage of the turboprop plane, which was carrying ten people, was swept toward a beach where rescuers treated surviving crewmen on the sand. All four of the dead are Moldovan while four French nationals and two Moldovans were injured. Local police told AFP the aircraft had been trying to land when it crashed. According to local news site Ivoire Matin one person was taken into custody after the crash. It is unclear if they are a member of the crew. Reuters news agency reports that the plane crashed during a storm with heavy rain and lightning. The plane was a Ukrainian-made Antonov chartered by the French army as part of its anti-jihadist Operation Barkhane, a French military source told AFP.